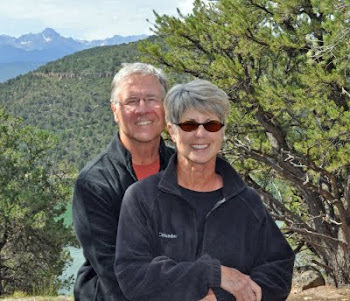 Find us on Google+ Rick and JoAnne's RV Travels: June 27, 2010 Bend, Oregon or Boulder, Colorado? June 27, 2010 Bend, Oregon or Boulder, Colorado? Today was a very short drive to Bend, OR. We had not been there before and were in for a real treat. Bend is a beautiful town, and we all agreed, being there was like being back in Boulder, Colorado. Bend has the same kind of environment, and same kind of people (read mountain bikers, runners, etc.). Unfortunately and soooo out of character, JoAnne did not have her camera…however I had my iPhone, took a photo and posted it on Facebook. We had a delicious lunch on the patio at the 900 Wall St. Restaurant and at the same time did some people watching. I must say I am not entirely sure why we ate at a restaurant. Bend was having "Bite of Bend" - an annual local chef cooking contest so the streets were lined with food vendors displaying and cooking their specialties. We had great fun just walking around the town, taking in the sights and great smells. After a fun afternoon in Bend we headed to Tumolo State Park - our home for the night.